Feelings: JR and I decided to celebrate our birthdays over the third annual Tomato Festival at Barbounia in Gramercy. Our busy journalist friend, JV also joined us for a drink for this momentous occasion. The atmosphere is very chic and modern, and it has a stereotypical Park Avenue-Gramercy vibe, which is absolutely ideal for birthday girls' night out. The service was flawless as well. To satisfy two lady Virgos (plus one nice Scorpio) celebrating their birthdays must have been a hard task, but they did an excellent job. They usually have a very pricey menu, but during the Tomato Festival, they had an excellent tomato inspired menu at $35 for three course meals (appetizers, entrees, and desserts). It was hard to narrow down to one dish, but we both picked tuna tartare with sweet plum tomato for appetizer and pan seared monkfish in tomato saffron sauce for entree. I lived in the center of authentic New York Greek food in Astoria for over four years. 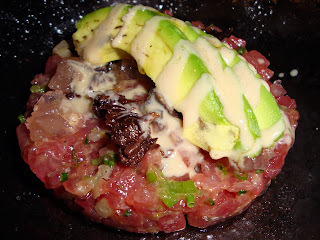 I understand that this is Gramercy, and the food is more of fusion, but I felt both the tuna tartare and monkfish lacked in flavor. The tuna and monkfish were fresh and well executed, but unfortunately, they masked the flavor of tomatoes. 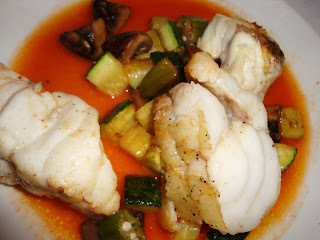 Especially for the monkfish dish, both JR and I wanted more chunks of tomatoes since the tomato flavor was nonexistent. It is so incredibly hard to find flavorful tomatoes. 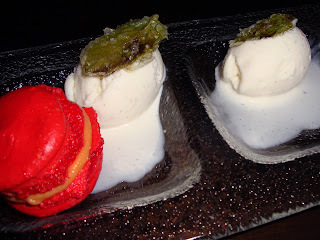 For dessert, JR ordered sesame pate sucre with sweet tomato compote with Parmesan ice cream. Unlike our entrees, the dessert had bold flavor. 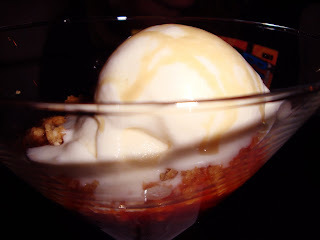 It had an interesting mixture of sour and sweet essence with creamy ice cream texture. We could not detect much of Parmesan flavor, so we were skeptical to see where the actual Parmesan was, but she later on said, "There was definitely Parmesan in that ice cream because I was burping it up the whole ride home." Ah, sneaky Parmesan. Thankfully I avoided the parm burp since I ordered macaron with tomato ganache for dessert. They spelled it as "macaroon" on the menu, so I was expecting the coconut cookies, but they turned out to be my favorite French pastry of all time, macarons! The tomato ganache was sweet and tangy, and the chewy texture of macaron was excellent. I wanted more juicy and flavorful tomatoes, but it was still a great deal for $35 to enjoy the night with my lovely girlfriends over three tomato courses. I actually felt as if I was one of the judges for Iron Chef tomato battle.